The 39 Steps, a play described as spy novel meets Monty Python, is now on stage at the Gerrard Art Space. A number of events are set for April at the Gerrard Art Space. The young artists of Seneca Hill Private School will be holding a group show until 21. A reception featuring the artists is set for Sunday, April 14, from 3 to 6 p.m. The Gerrard Art Space is located at 1475 Gerrard St. E.
The Seneca Hill school is located in Don Mills. Also, Mortar and Pestle Productions will be staging The 39 Steps. 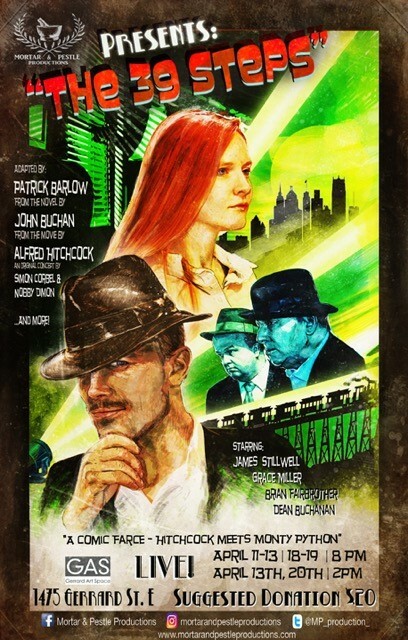 The play by Patrick Barlow is adapted from John Buchan’s novel and is described as a “spy novel meets Monty Python adaptation” of Alfred Hitchcock’s classic film from 1935. Four actors will play a “slew of madcap characters” in the Mortar and Pestle production. Show times are April 12, 13, 18 and 19 at 8 p.m. There will also be Sunday matinees on Saturday matinees on April 13 and 20 at 2 p.m.